In January, Law No. 4 of January 26, 2017, establishing the Labor Transformation and Flexibility Law (the “Law”), commonly known as the Labor Reform, took effect. This Law provides mechanisms that allow more flexibility in hiring and provide incentives to add more employees. The Law states that some changes will only apply to newly hired employees, so it is important to consult your legal advisor about any issue related to the Law. The attorney noted that one of the significant changes is related to hiring temporary resources or part-time employees. The Law recognized that this is the most common kind of employee in private businesses, so that is why the Reform initiatives address their benefits. 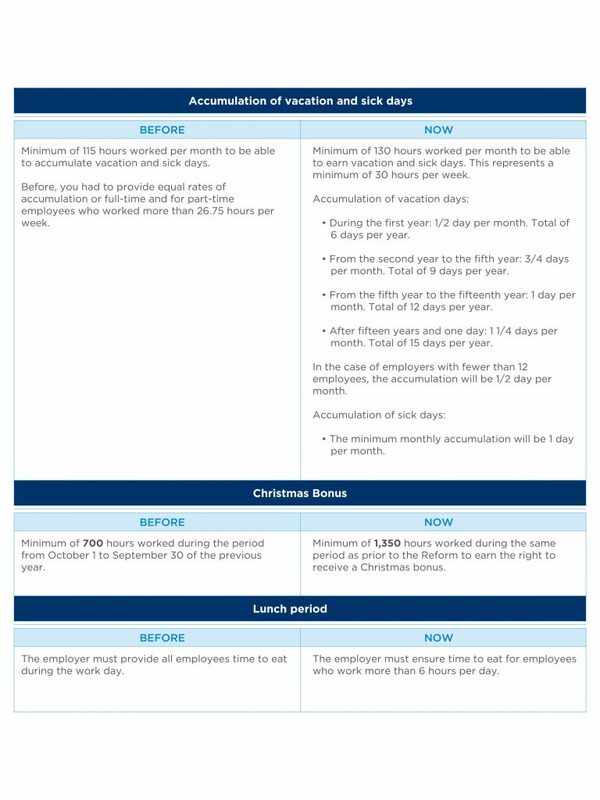 There are three important changes for this class of employees that can change the value and cost for any business: These changes are just part of the Labor Transformation and Flexibility Law. We encourage you to read the Law here for more details. This article is the first in a series about the Labor Reform that was prepared by the Banco Popular Business Banking Division to help you develop your business. We invite you to read the following article about changes in hiring employees by clicking here. 1 Banco Popular de Puerto Rico, its subsidiaries and affiliates do not offer legal, tax or accounting advice. The information provided in this material should be used only as a guide and not as a source of legal advice. The information provided here is current as of April 26, 2017, and does not consider, or will consider, any change that could have occurred or may occur in the future. The law firm Schuster Aguiló, LLC, and Popular, Inc., and/or its subsidiaries, affiliates, or related entities are not responsible for losses or damages (direct or indirect) that may be incurred by any institution, company, entity, business or person from the information contained here. All information provided in this material or any other related topic should be confirmed and corroborated with your legal advisor.